Azure is Microsoft’s public cloud offering. Offering a full range of services and features across the globe in various datacenters. It is the equivalent of AWS for Microsoft running primarily on the Hyper-V based hypervisor. While it is a great public cloud offering, it can be somewhat difficult to get integrated with which is what this guide aims to cover. Combine these features with on premise solutions like Azure-Stack and Morpheus can provide a single pane of glass and self service portal for managing instances scattered across both public Azure and private Azure Stack offerings. Morpheus even supports integrating with CSP based accounts in Azure (typically used by managed service providers). These are required for Morpheus agent install, communication, and remote console access for windows and linux. Other configurations, such as docker instances, will need the appropriate ports opened as well. Public IP assignment required for instances if Morpheus Appliance is not able to communicate with Azure instances private ip’s. Morpheus v2.10.3 added support for multiple Resource Groups and Storage Accounts per cloud, making our Azure integration more capable and easier to configure. Prior versions of Morpheus supported one resource group and one storage account per cloud, with the security group and network selection limited to the scoped Resource Group. If you are on an earlier version of Morpheus , please note you will need to add an Azure cloud integration for each Resource Group and Storage Account you would like to use. If you do not already have the Azure Active Directory credentials required to add an Azure cloud to Morpheus , use the steps below to obtain them. Click Create and your new Azure Active Directory Application will be created. Now that we have (or already had) our AD app, we will gather the credentials required for the Morpheus Azure integration. Copy the key value. You won’t be able to retrieve after you leave this blade. You now have the 3 Active directory credentials required for Morpheus Azure cloud integration. The Active Directory Application used needs to be an owner of the subscription used for the Azure Morpheus cloud integration. Select “2. Add Users” and in the search box begin to type the name of the AD Application created earlier. the AD Application will not display by default and must be searched for. Select the Application, then click “Select” at the bottom of the Add Users pane, and the select “OK” at the bottom of the Add Access pane. Be sure to select “OK” at the bottom of the Add Access pane or the user addition will not save. You now have the required Credentials to add an Azure cloud integration into Morpheus . You will also need to have existing Network Security Group(s), Virtual Networks(s) and Storage Accounts(s). Instructions for creating these can be found later in this article. Azure is now ready to be added into Morpheus . Ensure you have the noted Subscription ID, Tenant ID, Client ID, and Client Secret accessible. In Infrastructure - Clouds, select “+ Create Cloud” and select Azure from the cloud widget. If everything is entered correctly, the Location dropdown will populate. Your Azure Cloud will be created. In the main Azure toolbar, select the right arrow at the bottom of the toolbar (if collapsed) and search for and select Network Security Groups. Enter a unique name for the security group, select the correct subscription, and either select the resource group being used, or create a new one as shown below. Also verify the Location is the same, and then click “Create” at the bottom of the pane. Configure inbound and outbound rules for the security group. Ports 80 (http), 443 (https) 22 (ssh) and 5985 (winrm) need to be open to and from the Morpheus appliance. In the main Azure toolbar, select the right arrow at the bottom of the toolbar (if collapsed) and search for and select Virtual Networks. Enter a unique name for the virtual network, the correct subscription, select “Use existing” and select the same resource group as the Network Security Group. Also verify the Location is the same, and then click “Create” at the bottom of the pane. In the main Azure toolbar, select the right arrow at the bottom of the toolbar (if collapsed) and search for and select Storage Accounts. Enter a unique name for the storage account, select “Locally-redundant storage (LRS) for Replication, select the correct subscription, select “Use existing” and select the same resource group as the Network Security Group and Virtual Network. Also verify the Location is the same, and finally click “Create” at the bottom of the pane. So far this document has covered how to add the Azure cloud integration and has enabled users the ability to provision virtual machine based instances via the Add Instance catalog in Provisioning. Another great feature provided by Morpheus out of the box is the ability to use Docker containers and even support multiple containers per Docker host. To do this a Docker Host must first be provisioned into Azure (multiple are needed when dealing with horizontal scaling scenarios). To provision a Docker Host simply navigate to the Cloud detail page or Infrastructure?Hosts section. From there click the + Container Host button to add a Azure Docker Host. This host will show up in the Hosts tab. Morpheus views a Docker host just like any other Hypervisor with the caveat being that it is used for running containerized images instead of virtualized ones. Once a Docker Host is successfully provisioned a green checkmark will appear to the right of the host marking it as available for use. In the event of a failure click into the relevant host that failed and an error explaining the failure will be displayed in red at the top. Some common error scenarios include network connectivity. For a Docker Host to function properly, it must be able to resolve the Morpheus appliance url which can be configured in Admin|Settings. If it is unable to resolve and negotiate with the appliance than the agent installation will fail and provisioning instructions will not be able to be issued to the host. A very common scenario for Managed Service Providers is the need to provide access to Azure resources on a customer by customer basis. With Azure several administrative features have been added to ensure customer resources are properly scoped and isolated. For Azure it is possible to assign specific Networks, and Resource Groups to customer accounts or even set the public visibility of certain resources, therefore allowing all sub accounts access to the resource. Auto-scaling Azure instances can be done with the native Morpheus scaling service or Azure Scale Sets. When using Azure Scale Sets, Morpheus will configure the scale sets and thresholds, but Azure will be responsible for scaling the instances. The Instances nodes that are added and removed by Azure will be synced in by Morpheus as the instance scales up and down. Instances can only be added to Azure Scale Sets at provision time. 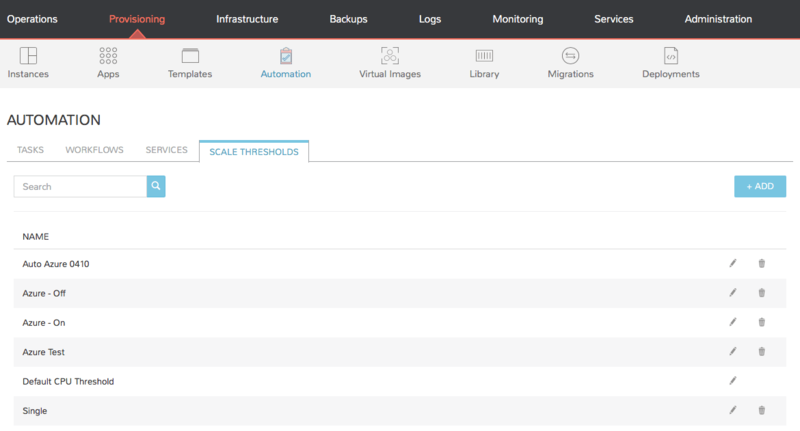 Complete the instance configuration and provision the instance. 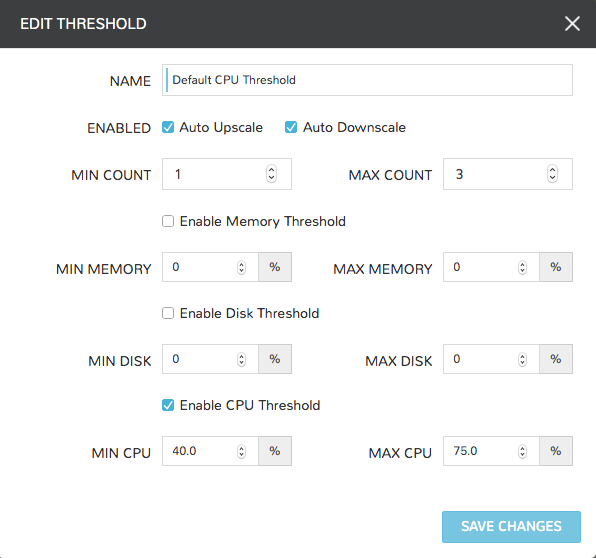 A Virtual Machine scale set will be created in Azure with the selected threshold and min/max node settings. Access to the SCALE THRESHOLDS section requires Instances - Thresholds Role permissions. The new Threshold will be available for selection in the SCALE section during provisioning or when configuring an App Blueprint. In Provisioning - Instances select the target Instance. 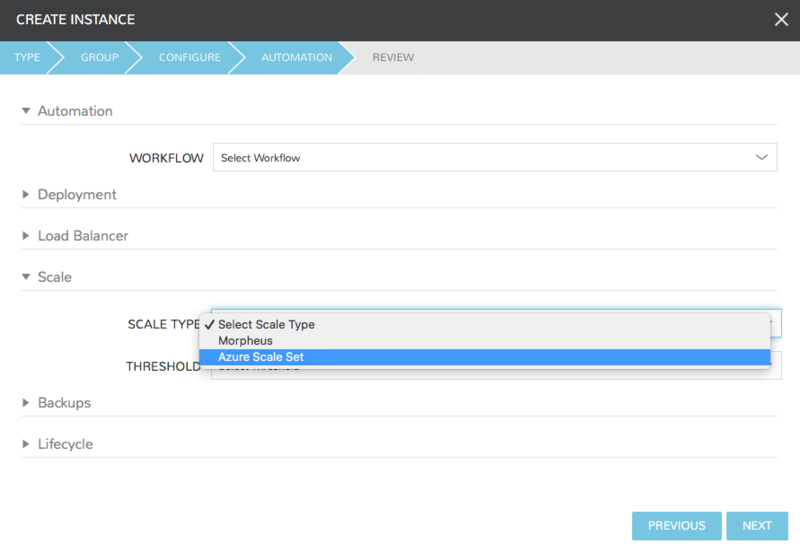 Morpheus will sync in changes to a scale sets threshold settings if the settings are edited in Azure.